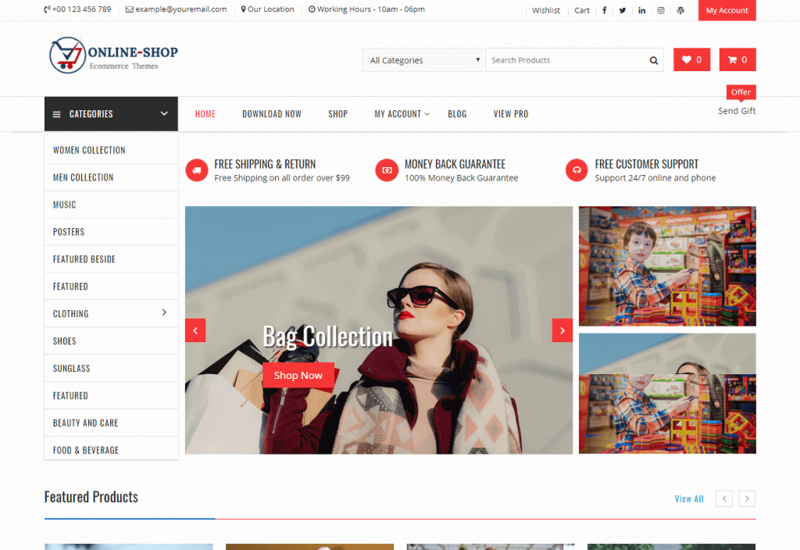 Online Shop is a powerful, beautiful and highly customized WordPress multipurpose e-commerce theme. Online shop provides you various features like highly customized options, and advanced custom widgets to create any kinds of online eCommerce sites. Online shop has limitless possibilities to create your online store unique and beautiful. Online shop allows you to create or redesigning website like fashion store, sports store, men – women or children store, jewelry store, kitchen or food store, toys store, digital product store, affiliate store or all in one store, So it will be fit on any kind of online store which you have. Online shop is fully compatible with popular plugin Woo Commerce and added custom widgets. Online Shop also has some other powerful features like advanced header options, footer options, sidebar options, copyright options, advanced slider options, featured category post, featured post page and etc. In addition, this theme has sticky sidebar options, single post options, WooCommerce page options, sticky menu options, special menu options, advanced logo options, advertisement options and many more. So if you are searching any e-commerce theme to create website then you can try Online shop theme because it has all those thing which you want in your website. Online shop is fully responsive it will be looks good in all type of devices from desktop to mobile.